This news item was posted in Business category and has 2 Comments so far . Gold price witnessed bullish trend in local and international gold markets on Saturday. Gold prices crossed Rs 38,000 per tola. 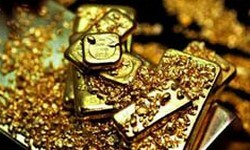 Gold prices increased to Rs 38,250 per tola, up by Rs 750 whereas the price of 10 grams increased to Rs 32,785, up by Rs 643. In the international market, gold price reached to $1213 per ounce, up by $28. Good day, Nice submit. There’s an issue along with your website around industry, may possibly take a look? Web browser on the other hand may be the market place key and a beneficial a part of individuals will omit a person’s fantastic crafting for that reason problem. Important data. Fortunate us I discovered your website inadvertently, and I’m surprised the reason the following incident did not taken place prior! my partner and i saved the item We offer cash for your gold jewellery coins and diamonds.